Benny Bass was born in Kiev, Russia on this day in 1904. Bass held championship titles in both the featherweight and jr. lightweight divisions during the late 1920s and early 1930s. 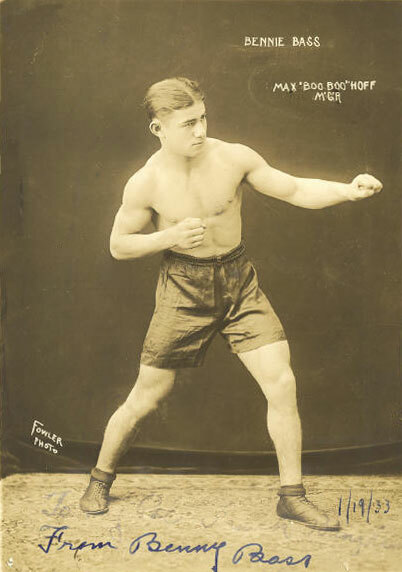 "The Little Fish" lived in and fought out of North Philadelphia, posting an overall record of 176-38-13 (63 KO) during his Hall of Fame career. He faced fellow ring greats Tony Canzoneri, Kid Chocolate, Red Cochrane, Henry Armstrong, as well as a who's who of early Philly legends including Johnny Jadick, Jimmy Tygh, Tommy Cross, Eddie Cool, Tony Falco, Patsy Wallace, Lew Massey, Harry Blitman, & Mickey Diamond. Bass won his first world title in a sock-fest against Red Chapman at Philadelphia's Municipal Stadium on September 12, 1927. The bout for the NBA featherweight title featured a double-knockdown of both boxers. Bass won the 10-round decision. He lost the crown the following year to Tony Canzoneri by 15-round decision at Madison Square Garden. Bass chased Canzoneri for a return bout but then settled for a shot at the jr. lightweight title. Bass won that championship on December 20, 1929 by knocking out Tod Morgan in two rounds at Madison Square Garden. Benny remained champ until his loss to Kid Chocolate at Shibe Park on July 15, 1931.